Nagpur: The urge to provide that cutting edge to the child is driving new age parents towards novel methods of personality development. Experimenting with theatre techniques is the latest in an array of tools that are available. 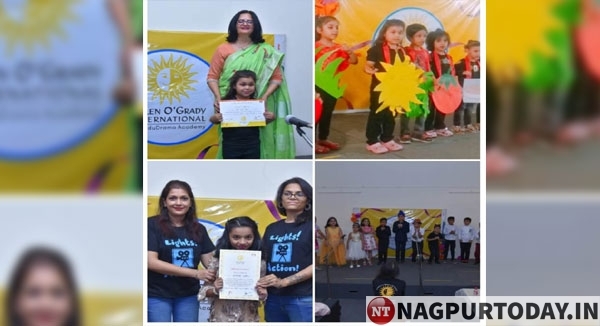 The Helen O Grady drama fest, which is one such quest in the direction of child development was held on Saturday, 30th March,2019 at Delhi Public School , Lava Nagpur . Organized by Kradle To Crayons(K2C), the Drama was performed by Children in the age group of 3 to 15 years. The Chief Guest for the event Ms. Anupama Sagdeo , Principal Delhi Public School, Lava took the platform to address the students on the importance of co-curricular activities. Speaking about the performances of students, she said that the efforts the children put in were commendable. The well scripted and perfectly enacted plays by children on Storyland, Mischievous Monkeys and Mobile fever kept the audience glued to their seats. The Parents were mesmerized watching their kids perform on Dance Drama’s with the likes of Fire in the pizza parlor , Tic Toc song and Hello song . Dressed in Bridal dresses, a bunch of cute little girls & handsome boys in suits walked down the ramp in a perfectly choreographed fashion show. Helen O’Grady Director Michelle Josan at Kradle To Crayons(K2C), Stuti Sharan , who runs the institute K2C & enthusiastic teachers Ms. Rumeet Kaur Uberoi , Ms. Kashish Lal made the yearlong program a huge success. The event was very well supported by Ms Khushi Vidhani, Ms Meghna Arora, Ms. Meenakshi Paunikar, Ms. Rakhi Borkar who took the parents through the show.